Canada Soccer have announced their preparation squad for a home send-off match in Montréal as part of the Men’s National Team’s build up to the 2017 CONCACAF Gold Cup. 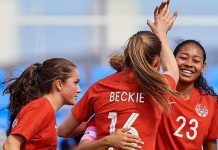 The Men’s International Friendly match is part of a three-match Summer of Soccer Series in Canada which includes a pair of Women’s International Matches in Winnipeg and Toronto. This marks the first time ever that Canada Soccer has hosted a combination trio of Men’s National Team and Women’s National Team international matches in different venues across Canada over the course of a week. The Women’s National Team has matches against Costa Rica on 8 and 11 June ahead of the Men’s National Team’s return to Montréal on 13 June. The expanded squad features 11 players from four different Canadian teams, including Montréal-based players Patrice Bernier, Maxime Crépeau, Anthony Jackson-Hamel, Wandrille Lefèvre, and James Pantemis. For Bernier, this could mark his last international match in front of his hometown fans at Stade Saputo. Four players have received their first call up to the Men’s National Team while two others are getting their second call up. Pantemis, Kwame Awuah, Juan Córdova, and Mark-Anthony Kaye are the debutants while Raheem Edwards and Tyler Pasher are both making their return to the Men’s National Team. In all, 17 of the 27 players are 25 years or younger, including Jonathan Osorio who will turn 25 on the day before the match in Montréal. In terms of experience, Bernier (53), Tosaint Ricketts (55), and Marcel de Jong (50) have all surpassed the half century mark in international matches. Additional experience will come from Will Johnson (42), Adam Straith (42), Dejan Jaković (34), and Milan Borjan (32). From the larger group of players, coach Octavio Zambrano will reduce the size of his squad after an intra-squad match on 9 June, with only 18-20 players dressing for the international match on 13 June. After the 13 June match, Canada Soccer will announce their squad for the CONCACAF Gold Cup in mid June. The 40-man consideration list for the CONCACAF Gold Cup will be announced on 1 June.